Corvallis upholstery cleaning services. Satisfaction guaranteed! Doesn’t sitting in your cozy chair or lying on your soft couch feel better when it’s clean? Sure it does. Whether you’ve got a well-loved chair or a couch that’s barely recognizable, our upholstery cleaning service will have you relaxing in and enjoying the soft touch of your couch again – just like the day you bought it. If you don’t love your furniture when we’re done – you don’t pay! No questions. Every upholstery cleaning service is backed by our 100% RISK-FREE, money back guarantee. Our fast drying time helps you enjoy your furniture sooner rather than later? We strive to have your furniture clean and dry – and you sitting in it – in about a half hour. Want the stain removed but not the color? Our deep cleaning, but delicate, upholstery cleaning tools allow us to thoroughly clean and remove stains while protecting the color of your fabric. You’re busy – we understand. Our flexible scheduling allows us to work with you and your hectic schedule to make it as convenient as possible for you. Take pride in your furniture and let us help you feel its cozy embrace once again. Plus, so you can enjoy your favorite chair or couch even longer, we always apply a special protectant to repel pet odor, staining and minimize general wear and tear. Because the longer it stays clean, the longer it feels comfortable. Call us today. Paul and his sons at Rainbow are always able to restore our carpets and upholstery to almost like new! 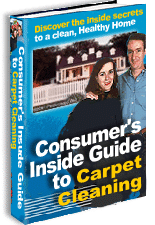 Want to see more carpet and upholstery cleaning service reviews or video testimonials? Visit our testimonials page here. We have hundreds for you to view! Discover why over 3,000 satisfied customers have turned to Rainbow Carpet Cleaning for many of their carpet and upholstery cleaning services needs.